Compressed gas suppressants such as FE-241® and HFC-227ea will not stall a diesel engine. If fire breaks out aboard a diesel powered vessel, the engine(s) must be shut down immediately for the Fireboy fire extinguisher system to effectively extinguish the fire. Continued engine operation may remove the agent, lowering the concentration required to effectively extinguish the fire, making an Engine Shutdown System necessary. Three model series are available for shutting down up to eight circuits with engine circuit relays featuring an operating range of 100 mA to 10 amps at 12 VDC unless otherwise noted. The 5000 and 8000 series are available with a 15-second time delay for GM diesels. Each engine shutdown system comes with a choice of round or square helm station display with integrated audible alarm, charged/discharged status lights, and manual override switch necessary for restart. 12 VDC or 24/32 VDC models are available. The ELS Series of Engine Shutdowns were developed to address low current, electronically controlled engines. Featuring sealed relays with gold-plated contacts, the ELS Series is guaranteed to operate in all electronic engine applications. Engine circuit relays feature an operating range of 10µA to 2 amps. Auxiliary relays have an operating range of 100 mA to 10 amps for the shutdown of generators, dampers, louvers, and other types of related engine room equipment. 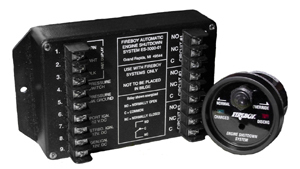 All ELS models are 12/24/32 VDC compatible with a choice of either a round or square display. The display unit comes with an integrated alarm horn, charged / discharged lights and an override switch for restart or control of auto-shutdown. Additional units and wire harnesses are available for a second station.